There, I said it. Now with that out of the way, let me tell you a story. Back in May, I participated in a drysuit diving day at my local quarry. As many of you know, quarries are amazing places to dive^1^, but we were there with a mission, to get our drysuit certification. Let me answer your question with a question: why do you get cold on dives? Now let me answer my question which was an answer to your question: heat flow. When you don your spiffy wetsuit (your wetsuit is spiffy, isn’t it? ), even though it fits good and snug (or should, anyway), it still allows some water in. During the dive, there is a steady, albeit slow, flow of water in and out. The cool water comes in, steals your body’s warmth, and takes it out, leaving you cold. The nerve. Dry suits^2^ put an end to this vicious cycle. They seal of your neck, ankles, and wrists, trapping air around your body, which helps insulate you from that sneaky cold water. Sounds fantastic, right? Let me get back to my story. Putting on a drysuit is a process. For one, the whole concept relies on seals to keep air in, and more importantly, keep water out. Leaks are a big deal. Seals have to be perfect^3^. Too loose, and water rushes in like Isengard, too tight, and you pass at before you get in the water. Even if you own a suit and have it set up, you have to check over these things. With all that air around your body, you become much more buoyant. Thus, drysuits require a ton of weight. I think I dove with 10 more pounds than I’ve ever used in my life. Having air move around your body makes diving trickier. Part of the reason drysuits require a separate certification is this trickiness. You have to know how to control your buoyancy using the suit’s air valves. More importantly, you need to know how to handle emergencies should they arise---from all the air going to your legs, making you hang upside-down (not so serious), to a runaway inflation valve (serious). In short, diving in a drysuit can be a real chore. I don’t claim to be an expert after a few dives, all I know is I have no desire to become one. Which brings us to the crux of the problem. 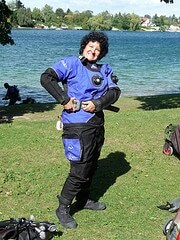 I hate drysuits, yet they are practically a necessity for cold water diving. The thing is, I wasn’t even that impressed with the suit’s ability to keep me warm. Dry, yes. Warm, no. I expected to be super-cozy, but in mid-50s water I was still very cold. Maybe not as cold as I would’ve been in a thick wetsuit, but far from comfortable, even with my thick insulation beneath the suit. The one word that comes to mind after my experience? Disappointing. I expected a lot of things out of dry suits, which they failed to deliver. They did, however, live up to their name. It was a dry, suit. My solution? No cold water diving. There are a few things I’d like to see in my life that are in cold water but I’ll cross that bridge when I get to it. In the meantime, I’ll stick with the tropics. Am I a baby? Perhaps, but scuba diving for me is a leisure activity. It’s not a job. I don’t have to do things I don’t wanna do. And you can’t make me. Not all is hopeless, though. There is one decent alternative to drysuits for many (not all) environments. We’ll save that one for another day. Do you hate drysuits, too, or do you just think I'm an idiot? The world awaits your input. 2. Is it dry suits (two words), or drysuits (one word)? I can’t find a consistent answer. 3. Speaking of seal sizes, apparently I have a pencil neck. The guy had to go down to women’s sizes to find one that fit me. Copyright © 2010-2016 - The Diving Blog. All rights reserved.